محمدپور, مریم, زینال‌زاده, کامران, رضاوردی نژاد, وحید, حصاری, بهزاد. (1396). ارزیابی پاسخ‌های هیدرولوژیک حوضه‌ آبریز به توسعه سامانه‌های آبیاری تحت‌فشار (مطالعه موردی: حوضه آبریز اهرچای). نشریه آبیاری و زهکشی ایران, 11(4), 626-635. مریم محمدپور; کامران زینال‌زاده; وحید رضاوردی نژاد; بهزاد حصاری. "ارزیابی پاسخ‌های هیدرولوژیک حوضه‌ آبریز به توسعه سامانه‌های آبیاری تحت‌فشار (مطالعه موردی: حوضه آبریز اهرچای)". نشریه آبیاری و زهکشی ایران, 11, 4, 1396, 626-635. محمدپور, مریم, زینال‌زاده, کامران, رضاوردی نژاد, وحید, حصاری, بهزاد. (1396). 'ارزیابی پاسخ‌های هیدرولوژیک حوضه‌ آبریز به توسعه سامانه‌های آبیاری تحت‌فشار (مطالعه موردی: حوضه آبریز اهرچای)', نشریه آبیاری و زهکشی ایران, 11(4), pp. 626-635. محمدپور, مریم, زینال‌زاده, کامران, رضاوردی نژاد, وحید, حصاری, بهزاد. ارزیابی پاسخ‌های هیدرولوژیک حوضه‌ آبریز به توسعه سامانه‌های آبیاری تحت‌فشار (مطالعه موردی: حوضه آبریز اهرچای). نشریه آبیاری و زهکشی ایران, 1396; 11(4): 626-635. این مطالعه اثرات هیدرولوژیکی تغییر سامانه‌های آبیاری در حوضه آبریز اهرچای را تحلیل می‌کند. به این منظور، یک رویکرد مفهومی بر اساس حسابداری آب به کمک مدل WEAP بکار برده شد. فرآیند هیدرولوژیک حوضه آبریز در قالب دو مدل به روش رطوبت خاک شبیه‌سازی شد. در گام بعد، مدل‌های ساخته شده مورد واسنجی و اعتبارسنجی قرار گرفته و اجزای بیلان هیدرولوژیک حوضه برآورد شدند. نتایج نشان داد تبخیر - تعرق کل در آبیاری تحت‌فشار بیش­تر از آبیاری سطحی بود (26٪). رواناب سطحی در دوره آبیاری تحت فشار بواسطه کاهش جریان‌ بازگشتی آبیاری و بارش از دوره آبیاری سطحی کم­تر بود (۵۲٪). این نتایج نشان داد رواناب سطحی می‌تواند توسط نوع آبیاری و بارندگی تحت‌تأثیر قرار بگیرد. در حالت کلی، بیلان آب حوضه کاهش زیادی پیدا کرد. نتایج تحقیق حاضر بیانگر پتانسیل منفی روش آبیاری تحت‌فشار روی هیدرولوژی حوضه آبریز است. همچنین نتایج نشان داد مدل WEAP امکان ارزیابی اثرات هیدرولوژیکی سامانه‌‌های مختلف آبیاری را بر روی منابع آب حوضه‌ آبریز دارد. در راستای مدیریت منابع آب حوضه‌های آبریز، روش حسابداری بیلان، آب باید برای جلوگیری از ایجاد سوء‌تفاهم‌ها در مورد اثرات هیدرولوژیکی آبیاری تحت‌فشار، مانند انتظارات غیرواقعی در صرفه‌جویی آب در حوضه‌های آبریز بکار برده شود. 2Assistant professor., Department of Water Engineering, Urmia Lake Research Institute, University of Urmia., Urmia., Iran. 3Associate professor., Department of Water Engineering, Faculty of Agriculture, University of Urmia., Urmia., Iran. This study analyzes the hydrological impacts of irrigation systems changes in the Ahar-chai basin. For this purpose, a conceptual approach based on water accounting was applied using WEAP model. Hydrological process of the basin in the form of two models of soil moisture method simulated. In the next step, the calibration and validation of models made and the components of the basin hydrologic balance estimated. The results showed that total evapotranspiration was higher in pressurized irrigation than in surface irrigation (26%). Surface runoff during pressurized irrigation period was lower than surface irrigation period (52%), due to reducing irrigation return flow and rainfall. These results show that the surface runoff can be influenced by the type of irrigation and rainfall. In general, the water balance greatly reduced in the basin. The results indicated the negative potential of pressurized irrigation on basin hydrology. Results also showed that WEAP model is able to assess the hydrological impacts of different irrigation systems on basin water resources. To basin water resources management, the water balance accounting methodology should be implemented to avoid misunderstandings about the hydrological impacts of pressurized irrigation, such as unrealistic expectations in water saving in the basin. احمدزاده،ح.، مرید،س. ۱۳۹۲. ارزیابی بهره‌وری آب کشاورزی با استفاده از مد SWAT مطالعه موردی، حوضه زرینه‌رود، پایان‌نامه کارشناسی ارشد، دانشگاه تربیت مدرس. باقری هارونی،م.ح.، مرید،س. ۱۳۹۲. مقایسه مدل­هایWEAP وMIKE BASIN در تخصیص منابع آب (مطالعه موردی: رودخانه تالوار) پژوهش‌های حفاظت آب و خاک( علوم کشاورزی و منابع طبیعی. 20. 1: 151-167. طلوعی،ظ.، دلاور،م.، مرید،س.، احمدزاده،ح.، ۱۳۹۳. ارزیابی مقدار آب برگشتی ناشی از آبیاری در حوضه آبریز زرینه رود و تاثیر بکارگیری سیستم­های آبیاری تحت فشار بر آن با استفاده از مدل SWAT، پنجمین کنفرانس مدیریت منابع آب ایران. قره‌چایی،ح.ر.، مقدم‌نیا،ع.ر.، ملکیان،ا.، احمدی،ا. 1394. جداسازی اثرات تغییرپذیری اقلیمی و فعالیت­های انسانی بر رواناب حوضه آبخیز بختگان. فصل­نامه علمی پژوهشی اکوهیدرولوژی. 2.4: 445-454. محمدپور،م.، زینال­زاده،ک.، رضاوردی‌نژاد،و.، حصاری،ب. 1395. واسنجی و اعتبارسنجی مدل WEAP در شبیه­سازی اثر تغییر سیستم‌های آبیاری روی پاسخ هیدرولوژیک حوضه آبریز اهرچای. مجله اکوهیدرولوژی. ۳.3: 477-490. یزدان‌پناه،ط.، خداشناس،س.ر.، داوری،ک.، قهرمان،ب. 1387. 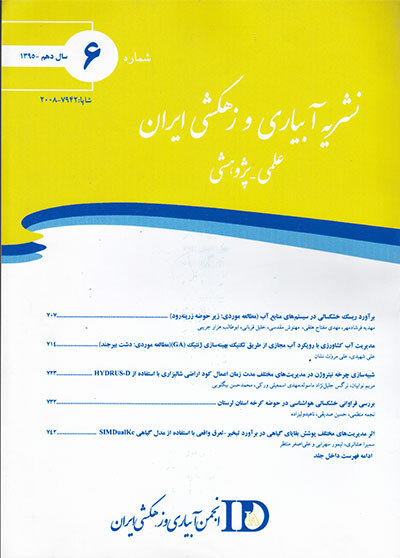 مدیریت منابع آب حوضه آبریز با استفاده از مدل WEAP (مطالعه موردی حوضه ازغند). مجله علوم و صنایع کشاورزی. ویژه آب و خاک. ۲۲.۱: 213-222. Burt,C.M., Clemmens,A.J., Strelkoff,T.S., Solomon,K.H., Bliesner,R.D., Hardy,L.A., Howell,T.A., Eisenhauer,D.E. 1997. Irrigation performance measures: efficiency and uniformity. Journal of Irrigation and Drainage Engineering. 123.6: 423–442. Cavero,J., Beltrán,A., Aragües,R. 2003. Nitrate exported in the drainage water of two sprinkler irrigated watersheds. J. Environ. Qual. 32: 916-926. Causapé,J., Quílez,D., Aragüés,R. 2004. Assessment of irrigation and environmental quality at the hydrological basin level. I. Irrigation quality. Agricultural Water Management. 70: 195–209. Clemmens,A.J., Allen,R.G., Burt,C.M. 2008. Technical concepts related to conservation of irrigation and rainwater in agricultural systems. Water Resources Research. 44. 16. Flores-López,F., Galaitsi,S.E., Escobar,M., Purkey,D. 2016. Modeling of Andean Páramo Eco-systems’ Hydrological Response to Environmental Change. Water. 8.3: 1-18. Groves,D.G., Yates,D., Tebaldi,C. 2008. Developing and applying uncertain global climate change projections for regional water management planning. Water Resources Research. 44: 1-16. Huffaker,R. 2008. Conservation potential of agricultural water conservation subsidies. Water Resources Research. 44: 1-8. Hussain,I., Turral,H., Molden,D., Ahmad,M.U.D. 2007. Measuring and enhancing the value of agricultural water in irrigated river basins. Irrigation Science. 25.3: 263–282. Ingol-Blanco,E and McKinney,D. 2012. Development of a Hydrologic Model for the Rio Conchos Basin. Journal of Hydrologic Engineering, accepted, Posted ahead of print 15. Isidoro,D., Quílez,D., Aragüés,R. 2004. Water balance and irrigation performance analysis: La Violada irrigation district Spain) as a case study. Agricultural Water Management Journal. 64.2: 123–142. Jensen,M.E. 2007. Beyond irrigation efficiency. Irrigation Science. 25.3: 233–245. Kienzle,S.W and Schmidt,J. 2008. Hydrological impacts of irrigated agriculture in the Manuherikia catchment, Otago, New Zealand. Journal of Hydrology . 47.2: 67-83. Lecina,S., Playán,E. 2006a. A model for the simulation of water flows in irrigation districts. II. Application. Journal of Irrigation and Drainage Engineering. 132 .4: 322–331. Lecina,S., Playán,E. 2006b. A model for the simulation of water flows in irrigation districts. I. Description. Journal of Irrigation and Drainage Engineering. 132.4: 310–321. Lecinaa,S., Isidorob,D., Playánc,E., Aragüés,R. 2010. Irrigation modernization and water conservation in Spain: The case of Riegos del Alto Aragón. Agricultural Water Management. 97:1663–1675. Martínez-Cob,A., Playán,E., Zapata,N., Cavero,J., Medina,E.T., Puig,M. 2008. Contribution of evapotranspiration reduction during sprinkler irrigation to application efficiency. Journal of Irrigation and Drainage Engineering. 134: 745–756. Mengistu,K.T., Förch,G., Hans,H., Horlacher,B. 2009. Watershed Hydrological Responses to Changes in Land Use and Land Cover, and Management Practices at Hare Watershed, Ethiopia . M.sc. thesis, Universität Siegen. Molden,D., Sakthivadivel,R. 1999. Water accounting to assess use and productivity of water. International Journal of Water Resources Development. 15.1/2: 55–71. Perry,C., Steduto,P., Allen,R.G., Burt,C.M. 2009. Increasing productivity in irrigated agriculture: agronomic constraints and hydrological realities. Agricultural Water Management Journal. 96.11: 1517–1524. Purkey, D., Huber-Lee,A., Yates,D., Hanemann,M., Herrod-Julius,S. 2007. Integrating a climate change assessment tool into stakeholder-driven water management decision-making processes in California. Water Resources Management 21: 315-329. Raskin,P., Hansen,E., Zhu,Z. 1992. Simulation of water supply and demand in the Aral Sea Region. Water International. 17: 55–67. Sánchez,I. 2008. Factores técnicos meteorológicos y agronómicos que afectan a la calidad del riego por aspersión en sistemas estacionarios. PhD dissertation. Universidad de Lleida. Lleida, Spain. 317 pp. Schlote,A., Hennigs,V and Schaffer,U. 2012. Water Balance for the Aleppo Basin, Syria Implications of Land Use on Simulated Groundwater Abstraction and Recharge. International Conference Hydrogeology of Arid Environments, . Federal Institute for Geosciences. Seckler,D., Molden,D., Sakthivadivel,R. 2003. The concept of efficiency in waterresource management and policy. In: Kijne, W., Barkers, R., Molden, D. (Eds. ), Water Productivity in Agriculture: Limits and Opportunities for Improvement. CAB International, Wallingford, United Kingdom, pp. 37–51. Skhiri,A., Dechmi,F. 2012. Impact of sprinkler irrigation management on the Del Reguero river (Spain). I: Water balance and irrigation performance Agricultural Water Management. 103:120– 129. Sieber,J., Purkey,D. 2007. User Guide for WEAP21 (Water Evaluation And Planning System). Stockholm Environment Institute, 219 pp. Tedeschi,A., Beltran,A., Aragüés,R. 2001. Irrigation management and hydrosalinity balance in a semi-arid area of the middle Ebro river basin (Spain). Agricultural Water Management Journal. 49 .1: 31–50. Water Framework Directive European Union. 2000. Directive 2000/60 of the European Parliament and of the Council establishing a framework for community action in the field of water pollution. Official Journal, 327: 1–72. Willardson,L.S., Allen,R.G., Frederiksen,H.D. 1994. Elimination of irrigation efficiencies. In: Proceedings of the 13th Technical Conference USCID, USCID (Ed. ), Denver (CO), USA, p. 17. Yates,D., Sieber,J., Purkey,D and Huber-Lee,A. 2005a. WEAP21: A demand-, priority-, and preference-driven water planning model. Part 1: Model characteristics. Water International. 30.4: 487-500. Yates,D., Purkey,D., Sieber,J., Huber-Lee,A and Galbraith,H. 2005b. WEAP21: A demand-, priority-, and preference driven water planning model. Part 2: Aiding freshwater ecosystem service evaluation. Water International. 30.4: 501-512. Yates,D., Purkey,D.R., Sieber,J., Huber-Lee,A., Galbraith,H., West,J., Herrod-Julius,S., Young,C., Joyce,B., Rayej,M. 2009. Climate driven water resources model of the Sacramento Basin, California. Journal of Water Resources Planning and Management. 135: 303-313. Young,C.A., Escobar-Arias,M.I., Fernandes,M., Joyce,B., Kiparsky,M., Mount,J.F., Mehta,V.K., Purkey,D., Viers,J.H., Yates,D. 2009. Modeling the hydrology of climate change in California? Sierra Nevada for subwatershed scale adaptation. JAWRA Journal of the American Water Resources Association. 45. 1:409- 423.